The Flowers24hours team have been inspired by the beautiful sunny weather this summer; our florists have been continuously boosting the plants and flowers selection; giving the overall catalogue a modern uplift. 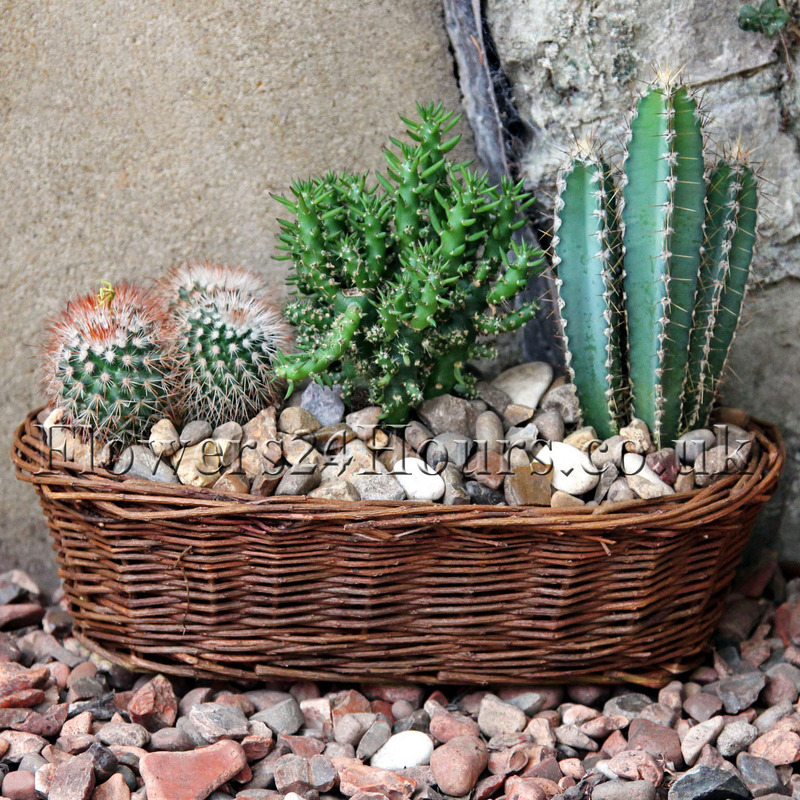 This month the flower designers have been focusing on the Cacti selection, the exotic plants line has been updated with new and improved cactus gifts in a range of hand-woven baskets, ceramic pots and vases; each design has been decorated with a mix of pebbles, stones and Spanish moss. The florists have designed the gifts to suit both men and women and to be fitting in a home or office environment. The cactus plants have been sourced from Mexico, Columbia and Peru. 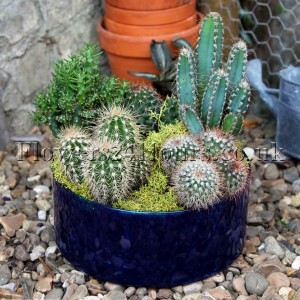 The prickly planted arrangements are very easy to maintain and can be a joy to own, Cactuses are best suited in a conservatory as in winter they need to be in a temperature around 10 degrees, and in the summer they love the heat and warm temperature of the summer sun. The exotic plants only need watering once every 3 weeks and need to be replanted with new soil every 2-3 years. 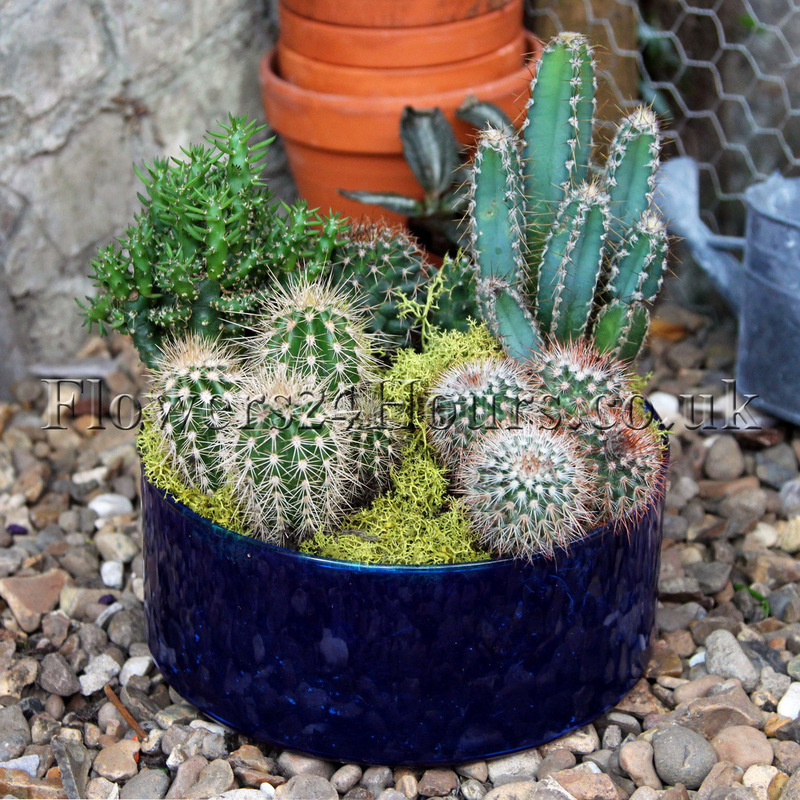 If you are not lucky enough to own a conservatory then Flowering cactus plants like to be placed on a window sill or in a well-lit area. This plant gift is available for same-day London delivery and includes an assortment of exotic cacti’s; three cacti’s are placed into a hand-woven basket. 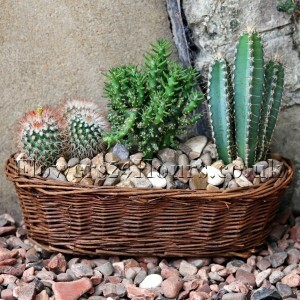 The plants are then decorated with natural stones and pebbles, a beautiful gift for a home or office. 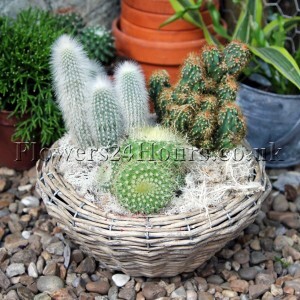 An exotic plant gift that anyone would love, Arizona is filled with South American cacti’s which are placed into a whitewash hand-woven basket, the plants are then decorated with fresh Spanish moss; a charming gift for any plant enthusiast. A little desert in your home! This vibrant gift would brighten up any home or office and is a suitable plant for both men and women. Sahara includes an assortment of South American cacti which are placed into a blue glass vase; the plants are then decorated with vibrant green Spanish moss. The gift is available for London delivery only. A miniature cactus plant to remind you of summer days, this little arrangement stands at approximately 20cm tall and would brighten up any home or office. 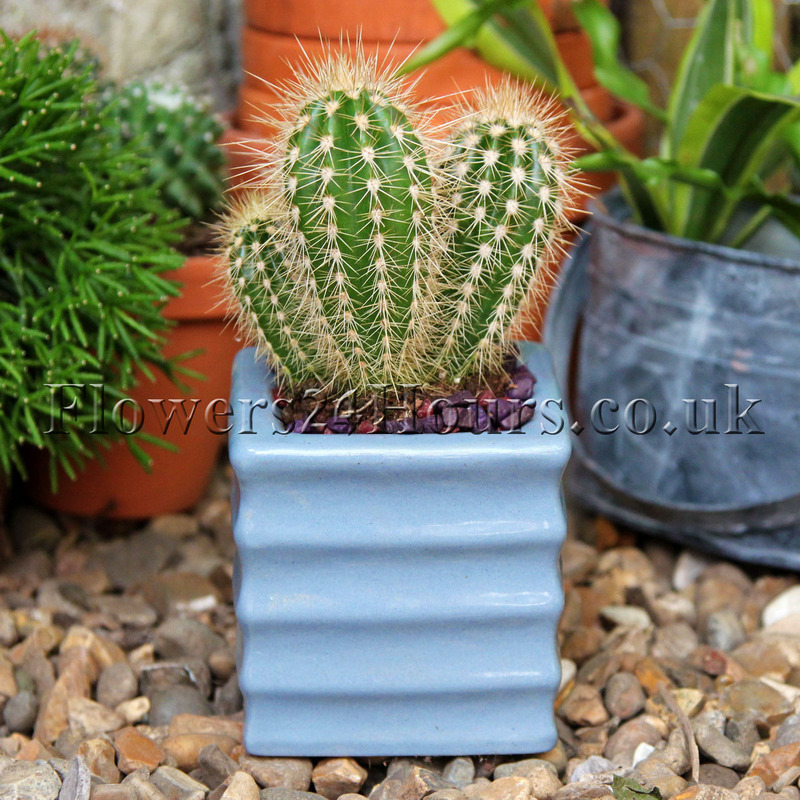 The South American cactus is placed into a small blue ceramic pot and decorated with purple and red stones; available for London delivery only this lovely little gift is priced at under £20.00! Flowers24hours – Flower delivery service in the UK. The team regularly updates there Flowers24Hours.co.uk Facebook Page and twitter accounts with special offers and new lines. The London florists are already starting to prepare a new and improved autumn selection. 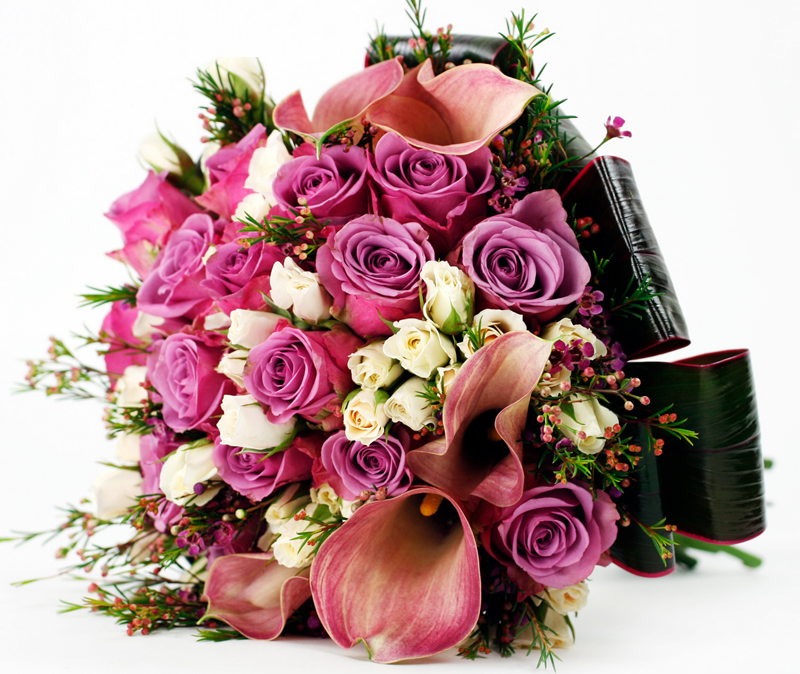 The London florist provides a specilised Flower delivery service in the UK. The online flower company is based in the heart of London and stock gifts and flower for delivery sameday to London and the surrounding areas. Ordering flowers and gift couldn’t be easier, Flowers24hours sleek advanced payment system allows customer to send flowers in London and the UK at a click of a button. Hotel Flowers – Luxury or Necessity?